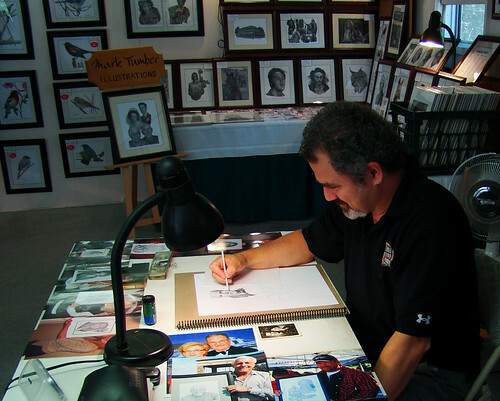 side view of MarkTumber working on a commissioned drawing, a photo by William J. Gibson, the Canuckshutterer on Flickr. In Honey Harbour, Ontario this morning, from my visit to the art sale show. 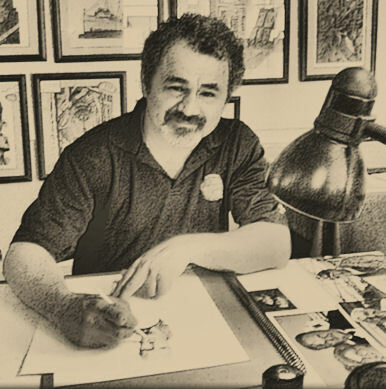 Mark Tumber, artist and teacher. Mark is using a white blending stick to graphite he has already laid down on the page. He uses 2B B H and 2H pencils, blending sticks and eraser to create photorealistic pencil drawings of people, wildlife, architecture, and other scenes. He teaches drawing and does commission work.